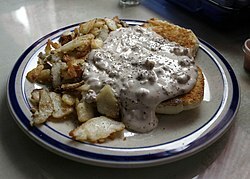 Biscuits and gravy is a popular breakfast dish in the United States, especially in the South. The dish consists of soft dough biscuits covered in either sawmill or meat gravy, made from the drippings of cooked pork sausage, white flour, milk, and often (but not always) bits of sausage, bacon, ground beef, or other meat. The gravy is often flavored with black pepper. Early European settlers in the United States brought with them a simpler and easy style of cooking, most often based on meat, ground wheat and gravy. After the first pigs were carried from England to Jamestown, Virginia in 1608, they became popular as a home-grown edible animal. Restaurant chains specializing in biscuits and gravy are found in North Carolina, which has Biscuitville, and West Virginia, which has Tudor's Biscuit World. Starting in 2015 McDonald's offered an all-day breakfast menu which served their traditional muffins in most of the United States, but limited biscuits mostly to the southeastern United States. Tomato gravy is white gravy mixed with crushed or diced tomatoes. In New Orleans, some neighborhood restaurants refer to a tomato sauce or Marinara style Italian sauce as Red Gravy. ^ "Food Is At The Very Soul Of U.s. Blacks` History Since Days Of". Retrieved 2016-09-12. ^ Hiskey, Daven. "Where the word "Biscuit Comes From"". Retrieved 4 December 2012. ^ Terry, Janet Sue (2005-08-01). A Rich, Deliciously Satisfying Collection of Breakfast Recipes. Just My Best Publishing Company. ISBN 9781932586435. ^ a b c "Biscuits & Cookies". Food Timeline. Retrieved 24 September 2015. ^ Why is the All Day Breakfast Menu different in some locations? 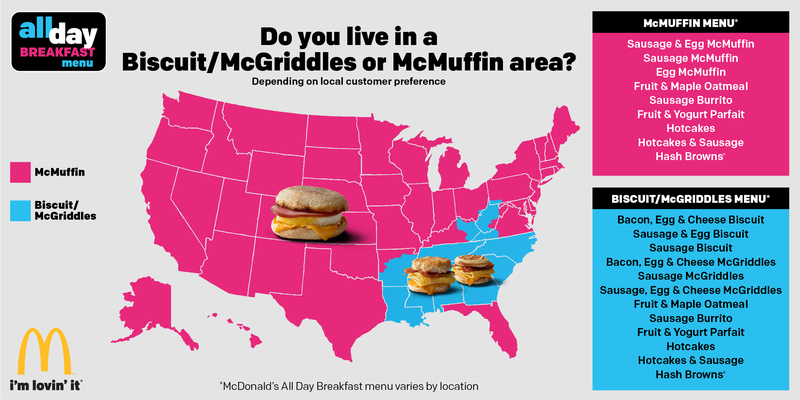 ^ Do You Live in a Biscuit/McGriddles or McMuffin Area? ^ "My Grandmother's Genius Biscuits & Gravy (Starring Pork Belly, Eggs)". 2016-05-04. Retrieved 2016-09-12. ^ "A gravy with a questionable past". Retrieved 2016-09-12.